A Million Suns New Lens - SolarChat! An amazing sky. Excellent new toy, Derek. Everyone I forgot to mention this was a 6s exposure. That's a great piece of glass Derek, and the results are fantastic. 6s, wow! Awesome shot for 6 sec Derek!!! 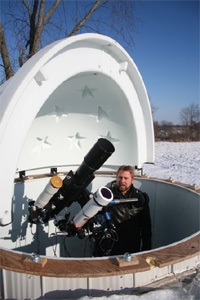 The lens looks to have huge potential astro imaging.